This Sunday, we will celebrate NHL’s 7th birthday. As we’ve done every year, we’ll throw him a birthday party. Nothing big and flashy, mind you. Only close family will be there, not giant groups of kids. His Phineas and Ferb theming doesn’t mean a rented party hall remade to resemble Perry’s secret lair. Instead, we’ll have a cake, some Phineas and Ferb figurines that we already own, and some themed plates/napkins. Of course, NHL’s reaching the age where he will want to start having parties with his friends. This will mean that we will need to start inviting other (non-family) kids NHL’s age. We will need to seek venues other than B’s parents’ house (e.g. bowling alleys). We may even need to plan entertainment. Growing up, I didn’t have many birthday parties. My parents threw one for my sister and I (since our birthdays are a mere 6 days apart) when I was about NHL’s age. The party went fine, except for the clown my parents hired. All the kids gathered in close to watch his act and got in close for a good view. Everyone, that is, except for my sister and I. We birthday kids were pushed to the back where we had a lousy view. Ever since then, we didn’t have any birthday parties. Instead, my mother would take my sister and I out to Friendly’s for lunch and ice cream. I’m not complaining, those lunches were special to me, but it does mean that I’m birthday-party-planning-challenged to some degree. 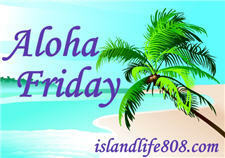 My Aloha Friday question for today is: Did you have birthday parties growing up? What special memories do you have of your birthdays growing up? We did (I have a twin brother) have birthday parties sometimes. But my favorite memories are of the birthdays spent with just my brother, sisters and parents. The only birthday I remember as a child was when I was 12 or 13. We had a houseful of kids with a lot of loud music. I remember The Beatles “Here Comes The Sun” playing over and over again. I was the big party mom when my kids were growing up. We had birthday parties, Halloween parties. New Year’s Eve parties. Beginning of Summer pool parties and end of summer pool parties. Quite often my daughter and her friends would come up with a party for no reason and the house would suddenly be filled with 30 teenagers. It was great! Yes i did mostly sleep overs. My kids usually have birthday parties too. Last year we skipped it and just bought a JuMPY for the yard. It certainly was well worth it’s use over and over! I didn’t have birthday parties when I was growing up. I do remember my friends threw a surprise birthday party for me when I was 15 – very cool because my mom let my friends invite boys, LOL! Birthday parties were just really simple back then. Lol. I am rather party-planning challenged myself! Hence my Aloha Friday asking for advice on goodie bags which I don’t remember as a kid! When I was really young we had pizza parties and as I hit 9 or 10 it was just a birthday dinner with family. I really want to give my kiddos a party with friends… and it is tough!